This morning I had the alarm set for 5:26 am as Jason had agreed to another morning run. However, when the alarm went off, Jason pretty much said, "NO." I am not one to fall back asleep easily, so I went ahead and got up and opted for a fun step workout. I chose one of the shorter premixes from Cathe's Step Blast. While I hadn't really wanted to do a step workout (had my mind set on a run), it was a fun, sweaty workout in the end. I really felt better after the workout. I had a nice boost of energy that got me through the rest of the day. It was also nice to just get out of the office for a bit. It was another gorgeous day here. Getting very spoiled by this fantastic weather. While I really did want to grill (had a few ideas), tonight wasn't the best night for a grilled dinner. Jason went for a bike ride with a friend after work. So I was solo for dinner (except for the company of the maniacs of course). I decided to do something easier tonight and something that would be easy enough to reheat for Jason. After reading 2 different recipes using the kale and apple combination (Anna @ Newlywed, Newly "Veg Salty + Sweet = Good" and Alicia @ Vegan Epicurean "Asian Inspired Raw Kale Salad with Lime Juice" ) I decided it was something I wanted to try myself. I sort of combined the 2 recipes opting to saute my kale rather than use the massaged method. 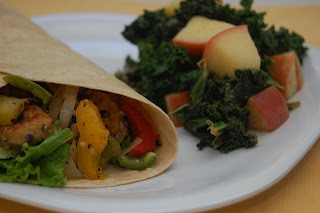 But, I used the flavor combinations from the massaged recipe for a Sauteed Citrus Kale and Apples to go along with a Tempeh "Steak" Pineapple and Pepper Wraps. Whisk together a few tbsp orange juice and miso paste in small bowl. In large skillet, saute kale in olive oil for just a few minutes, then add in the remaining ingredients (this includes the OJ/Miso mix) and saute until kale is just wilted, adding in orange juice as needed. Make the marinade first by whisking together all ingredients in shallow dish and allowing the tempeh to marinate at least 1 hour. Once tempeh has marinated, heat a large skillet and spray with non-stick spray. Quickly sear the tempeh on both side then set aside. In large skillet, saute onions, bell peppers, garlic, and jalapeno until soft. Stir in the pineapple, tempeh, and season. Serve in tortilla wrap with lettuce. Other options would be to serve one a sandwich roll or over rice, barley, or pasta. The Sauteed Citrus Kale and Apples turned out even better than I had imagined. This was such a great play on textures and flavors. I think another great addition would be cranberries. The wraps were also quite tasty. I didn't get in enough of the heat that I had hoped to get from the jalapeno to play off the sweet from the pineapple. But, overall, it was a great dish. because it’s unique; no one else has the same one. because no matter how badly you treat it, it’s willing to give you another chance. Great post Heather! I love the "8 reasons." I think all the time about how I want to model confidence and loving my body when I have a child, and even thought I don't have one quite yet, no better time to start practicing. I like it! I am now craving tempeh. Must go to the health food store! Hey Candice @ ChiaSeedMe I think it's so important that we remember that the way we act and the things we say do have an effect on the next generation. Somehow we have to stop the insanity regarding negative talk and self-doubt that we inflict upon ourselves. That was my last package of tempeh, need to make a WF trip myself! 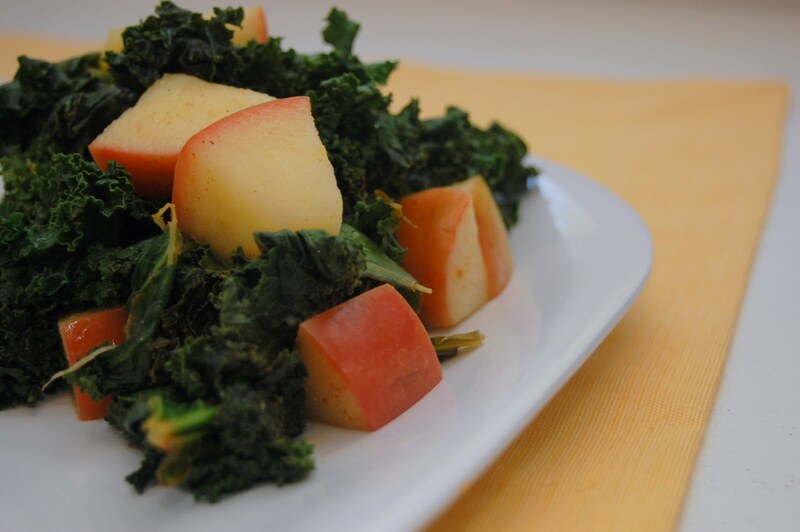 Glad you liked the kale/apple combination! I agree that it's even better than it sounds! I need to get my hands on some miso paste. Anna @ Newlywed, Newly Veg I was seriously doubtful until I started to really think it all through. Loved it and so did Jason. I think it'd also be a great winter dish adding in cranberries and maybe walnuts for crunch. Thanks for the inspiration! Thanks for the mention, Heather! I love that list. My favorite one is "because your daughter must learn to love hers". I don't have a daughter yet, but there are little girls in my family who are already obsessed with how they look. It's crazy! We really have to be careful about what we say about ourselves because we never know who is listening. Thanks again! I picked up some tempeh yesterday at the health food store so I will be making something with it soon. I may have to make a version of your dinner tonight. Also love your food for thought... always a good reminder!! You are an inspiration! I too like to workout, but lately have been in a bit of a slump. Don't know why. But it gives me so much encouragement to know that others out there care about fitness and good health too! I keep a vegan inspired blog. But I write about my adventures in exercise too, just in a private blog. Sometimes I think I should combine the two, but I don't know. But I do know that exercise is great! great list heather, i love that one! Eunice Thank you for the original inspiration! Kelsey @ Snacking Squirrel I totally agree. I think I need to print the list and post it on my monitor at work, on the wall of my workout room and on my bathroom mirror! Alicia @ Vegan Epicurean Thanks so much for the helping to inspire the dish!!! I love your creativity and it really helps me. I can't wait to see what you come up with for the tempeh!! Thanks Jessica @ Dairy Free Betty ! We could all use a little reminder right? Vegan Valerie first off, thank you so much for stopping by and leaving a comment. I am truly honored that I have somehow inspired you with fitness. I can't wait to check out your blog! I would love to see the 2 combined (but I may be just a little biased LOL). Take care! Averie @ Love Veggies and Yoga Glad you like the combo. It was really quite tasty. I often forget to cook with oranges. I do use a lot of lemons and lemon juice, but I really do like the flavor that fresh OJ can impart. and yum, your food always looks delish! Thanks so much for sharing your Tempeh "Steak" Pineapple and Pepper Wraps recipe - it looks amazing! Not sure if you ever tried La Tortilla Factory Low Carb/High Fiber Tortillas. They are only 80cals per tortilla and taste great! We use them for all of my meals – breakfast (egg burritos), lunch (all types of wraps such as turkey, veggie..etc) and dinner (pizzas) although they can be also used for snacks (you just have to get creative). If you are interested, we list one of my favorite recipes (Italian Veggie Pizza) on our site. Hope you like the recipe! Thanks for great post and forward to reading more! That's right! Your body is unique and individual and amazing! You're so inspirational girl! Yum Yucky Cathe's definitely the best for a good booty kicking! Thanks Jessica @ EatDrinkBreatheSweat ! Fit and Forty Something Ugh, hate those stupid Fat Days that are totally in our own head. Do men have fat day???? Kelly I think #6 is soooo important too. Hate to hear that you're having to go through a lot of "undoing." Let me know if you do make tempeh. I'll be very curious to hear how you like or don't like it. Hi Body Hacker I do use La Tortilla Factory brand actually. They're one of my top choices. I'll have to check out the Italian Veggie Pizza for sure. Thanks for posting! Jenna @ Healthy. Happy. Well. You're too sweet girl!!! LOVE those 8 reasons at the end of the post. I'm going to remind myself of those often and share them with others who need a little pick-me-up! great job hitting up the weights even though you werent feeling it! really loved the list of 8, thanks for sharing. Hey Katie @ Up Fit Creek glad you enjoyed them as much as I did. Definitely something to share! Janetha @ Meals and Moves Sometimes you just have to get going then it all falls into place.